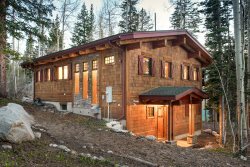 Moose Manse is located a short walk from Brighton Ski Resort and offers an unforgettable experience. This home has two large bedrooms upstairs each with a king size bed. The bathroom upstairs has an old fashion, deep claw foot tub for soaking. The living room, kitchen, and dining room are large and spacious for gatherings. The kitchen comes equipped with all the amenities needed. Downstairs there is a large room with two bunkbeds. One has two twins and the other has two queens - perfect for children. There is ample parking for 2-3 cars that is plowed after every storm. This cabin is one of the nicest accommodations for its size in the canyon..